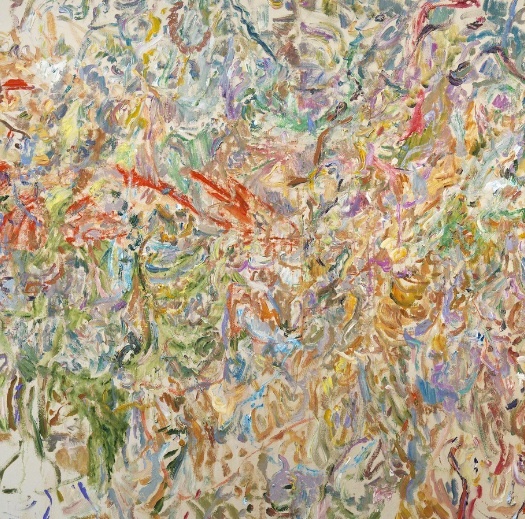 A nice reflection in Artsy about the Larry Poons show at Danese, one of my favorite galleries in NYC. I saw the last show of his latest work there a while back. Like Thiebaud, he’s as prolific as ever, regardless of age. The work seems somewhere between late Monet and 50’s AbEx, with his color reaching back to the French, for me at least. Bonnard, maybe? A not-for-sale cat. At least 50 shades of gray. David Rosenak has become sort of a mentor (for me) or an example of having integrity as an artist. So, to set the stage for how he has been an example, I’m going to share where my head is/was. I felt — and still feel — internal pressure to legitimize my obsession with art by turning it into a business. But I’m not capable of “branding” myself with a style and making pieces that are predictable and popular. I absolutely think art is a noble profession and if people sell their work well enough to put food on the table, I think that’s awesome! It’s great when art can be appreciated widely, but if you’re an artist you also know there’s an icky, slippery slope . . . when you’re making art mainly for other people. On the other hand, most of us are not simply expressing ourselves for its own sake, but trying to reach out and connect to some unknown viewer in an authentic and sincere way. More interesting things about David: he is color blind. When David was young and testing out his influences, he tried a few paintings in the style of Wayne Thiebauld, but since Thiebaud’s thing has a lot to do with color, David realized he was trying on someone else’s shoes (we all do that when we’re young, but some of us never grow out of it). Then he noticed his primary teacher was making some greyscale paintings, and he realized he’d been fighting a battle with color he had no hope of winning, so he switched to greyscale in 1981 and hasn’t looked back. 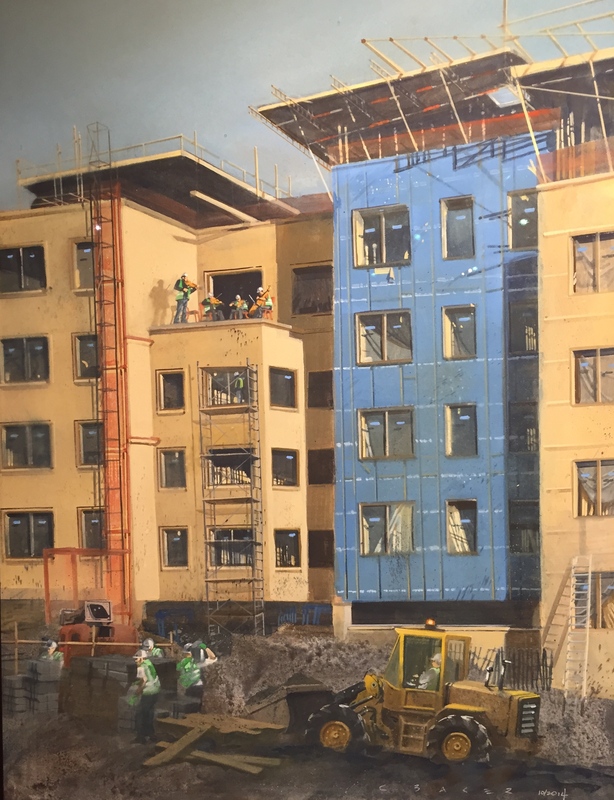 David has painted cityscapes since the late 80’s; he showed me a few scenes near his house in a medium sized scale. And they were cool. Then he made them small (nothing larger than 20″ and most average 10″ on the long side) and bam! They suddenly really worked. As the scale was becoming more intimate, the subject moved closer and closer to his home. 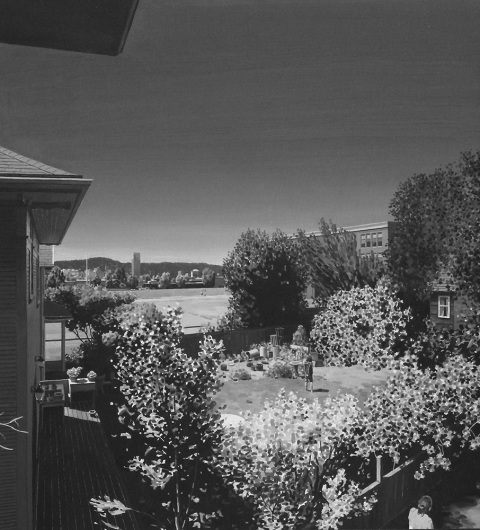 All the views are of his back yard or his view toward downtown Portland (Oregon). 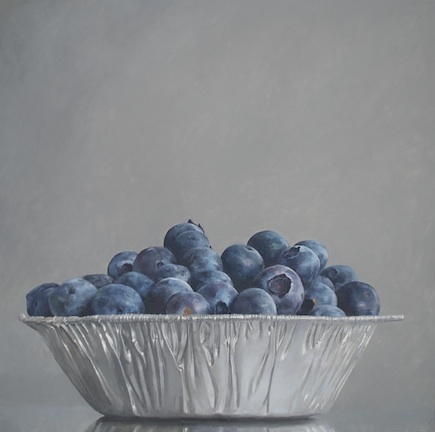 Since he has the subject, scale and approach settled, he is focusing on compositions, and they get more and more mature. He likes to joke that he is essentially making the same painting over and over again in an attempt to improve it. And he has many plans for new paintings within that framework. The adage of freedom coming from limitations is really true, I guess. 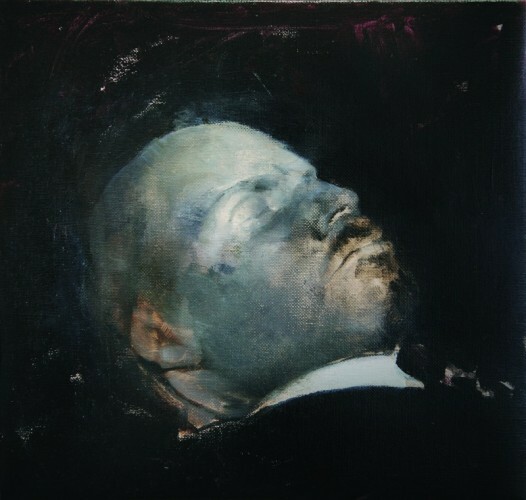 A portrait of Lenin, from the photograph of him lying in state. This is one of those paintings that makes you want to pick up a brush immediately. It reminds me of Michael Borremans, who had a knock-out show at Zwirner a while back, stunningly good, but since then. . . hm.) And this is stronger than his work. With both, less is more. I like Ghenie’s sense of humor. This interpretation of Lenin’s dead face reminds me of Blake’s life mask. 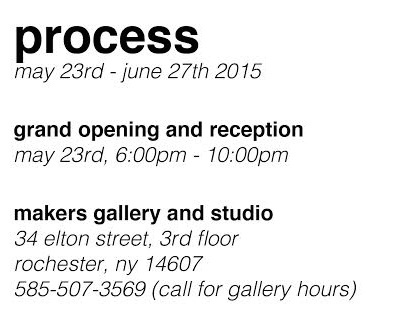 Join us at Makers Gallery and Studio, Saturday May 23rd from 6-10pm for our inaugural show entitled process. We are located in the Neighborhood of the Arts on the third floor of 34 Elton Street, Rochester (parking is directly across the street). Avvino will be providing drinks and hors d’oeuvres. Makers Gallery and Studio was founded by Alexander Gruttadaro, Anni Gruttadaro and Edward Zachary Graham. This studio is going to open its doors to a variety of art classes and workshops, taught by Alexander, Sari Gaby and other great local artists. This first show is about beginnings: the beginning of this studio and an exploration of the artists process. Each artist will feature works in progress as well as finished works, to develop a better understanding of how and why they create. 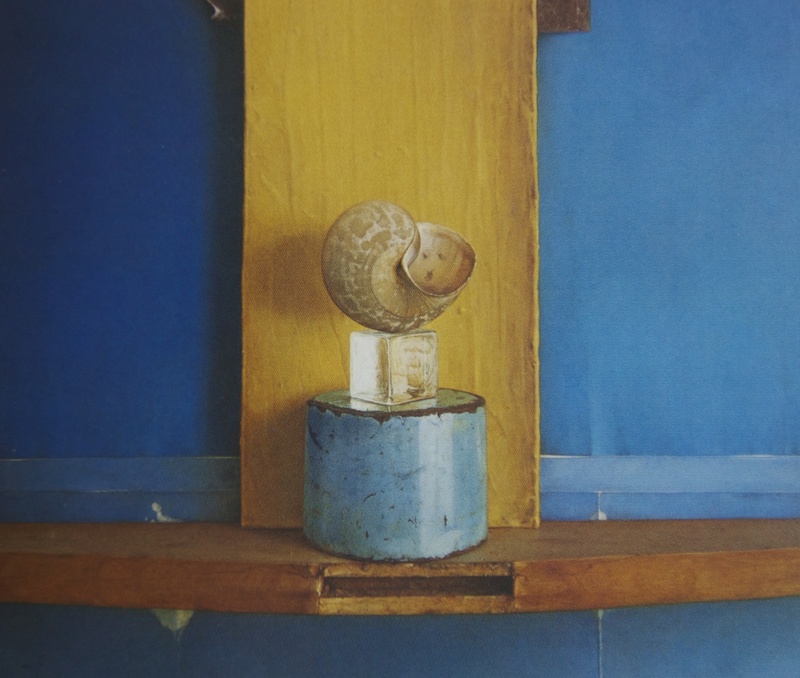 Each artist will allow you a look into their intimate space, as a modified version of their own studio. Our aim is for the viewer to better understand how work is created, so you can not only admire the finished product, but also the steps each artist takes on their journey. Each featured artist has a unique and recognizable style, giving depth and variety in this first show. We hope to see you at the first of many exhibitions and look forward to being a collaborative part of the special art community Rochester is so well known for. If you have any questions or wish to unsubscribe to our e-mails, please contact us at the information provided below. We look forward to seeing you on Saturday! Why paint? To paint, of course. I’ve been circling around this question for several years here, getting glimpses of an answer from different angles, at least in my case. And, when I have some time, I want to write at length about why painting points to a way of being engaged with the world that seems in greater and greater peril, with the rise of technology. All genuine work is in peril now, but especially craftsmanship rooted in tradition. Matthew Crawford’s new book has much to say about this, as did his first one. What’s become clearer for me are the motivations that don’t drive me to paint. (I might be better off if these other motivations did drive me, but they don’t.) It doesn’t depend on making money, though the income helps considerably and makes it easier to do the work. The metaphor of the pinball game used by the engineers to describe their work in Soul of a New Machine applies here: winning the game is getting to play another free one. It’s self-perpetuating. It doesn’t depend on recognition or exhibitions. Last year, I had work in eight shows—five of them juried. I’ve applied to nine juried shows this year and got into only one. What does that mean? Nothing, in terms of my dedication to painting. I don’t need to hear people talking about me either: my dealer here, Jim Hall, put it succinctly when he said recently that so much art that continues to be made on the assumption that it’s possible to be “cutting edge” often seems to be work created in order to be talked about. Work that offers little purchase for a discursive mind is considered decorative or otherwise beneath consideration. Some of my favorite artists created pictures about which it’s hard to say anything useful other than write a poem to honor them: you see their world and want to live in it by looking at it or singing about it. The foremost example would be Van Gogh, of course, but there are dozens of others. So being talked about doesn’t motivate me—or rather not being talked about has little effect on my eagerness to make a painting. So, my situation hasn’t changed since the long years when I painted and didn’t show my work. 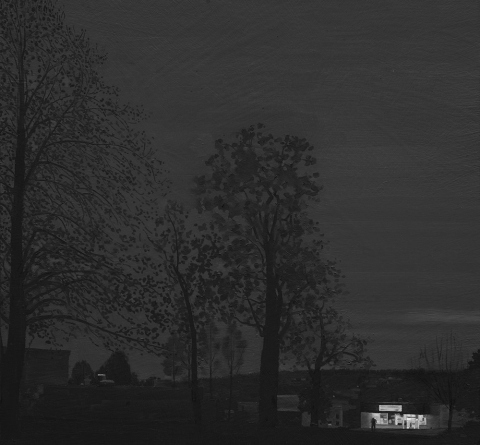 My eagerness hasn’t waned, because the act of making a painting is the point: it’s both the means and the end. When I sit down to paint, I still feel as if there is nothing else I would rather do than make a painting, until maybe, hours later, I get up to make a sandwich, and I’m motivated to start spreading peanut butter instead of paint. Whether I’m recognized or rewarded makes no difference. 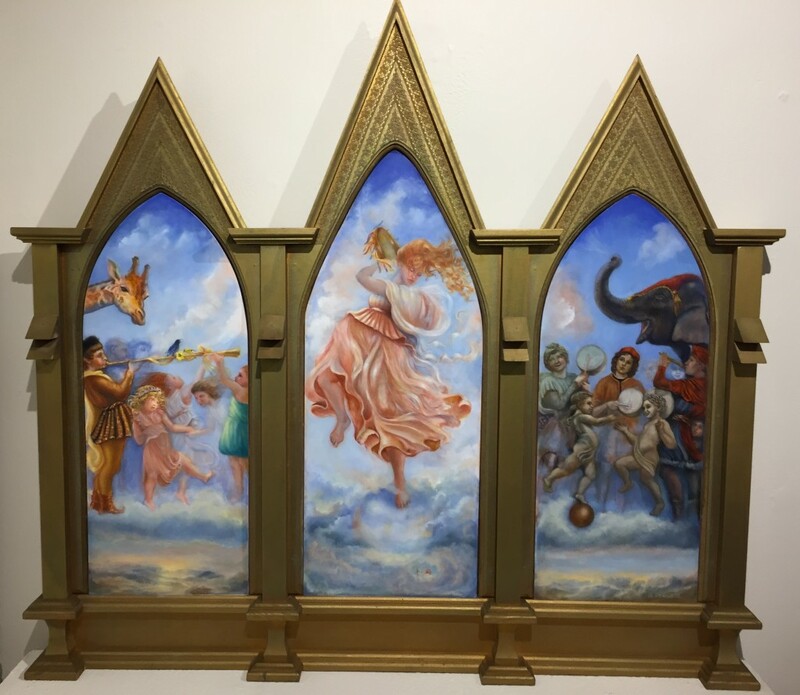 I painted for decades and rarely showed anything I was doing, partly because I didn’t want to and partly because my sort of representational work seemed to have no place in what was happening in the world of art. It wasn’t until the economy collapsed in 2008 that I got serious about showing and possibly selling work—a pretty funny and Quixotic bit of timing, given the economy since then. But it was a good indication that my motives didn’t grow out of whatever the world was going to give me in return for the work. I guess I’m saying that the motivation to paint is circular. Or is it recursive? I need to paint because I want to keep painting. I need to see what it shows me. Which will get me nowhere, other than where I already am, maybe to see it for the first time. So, for now, I’ll step out of that loop of thinking, and I get back to just doing it. 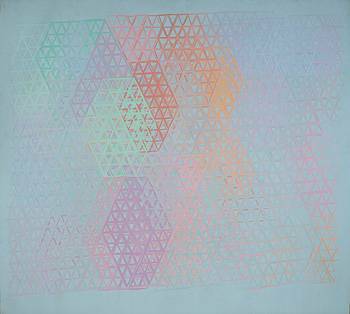 One of two paintings by Jose Sanchez (Felox) chosen for Manifest’s INPA 4. The astronomical rise in prices for the most-sought-after works of art over the last generation is in large part the story of rising global inequality. At its core, this is the simplest of economic math. 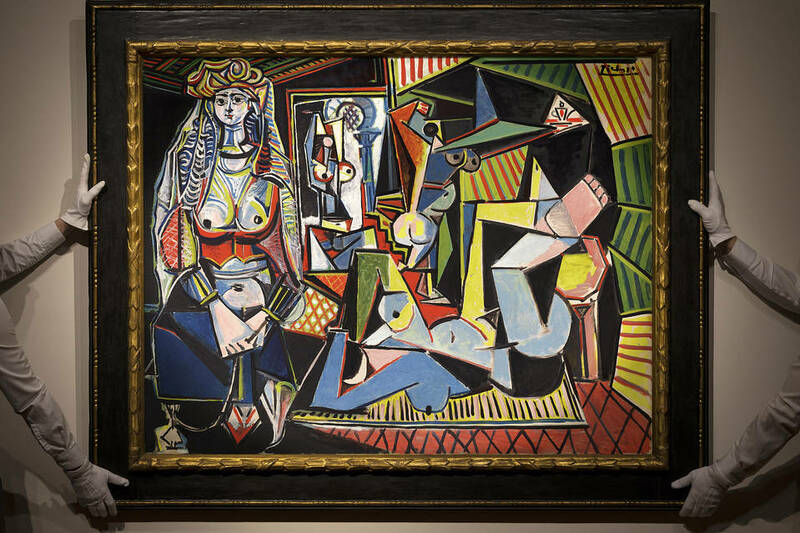 The supply of Picasso paintings or Giacometti sculptures (one of which sold for $141 million in the same auction this week) is fixed. But the number of people with the will and the resources to buy top-end art is rising, thanks to the distribution of extreme wealth. One of the most important findings of the leading economists who study inequality is that wealth and incomes at the very top are “fractal.” What they mean is that when you zoom in on the upper end of wealth distribution, patterns repeat themselves in an ever more finely grained pattern. Partners at law firms who are in the top 1 percent of all earners have seen their incomes rise faster than successful dentists who are in the top 10 percent. But by a similar margin C.E.O.s of large companies who are in the top 0.1 percent are seeing incomes rise faster than those law firm partners. Hedge fund managers in the top 0.01 percent are similarly outperforming the C.E.Os. And the kind of people who can comfortably afford to pay a nine-figure sum for a Picasso, the top 0.001 percent, say, are doing still better than that. This art market boom isn’t as pretty a picture as it seems, however. First, there are worries that it’s all a bubble that could burst at any moment. But then there are bigger concerns about the wider societal costs of such an inflated art scene. The person who purchased Picasso’s masterpiece may be anonymous. But there are signs that we are all paying the price for such extravagant private auctions. Public museums can’t keep up with soaring prices. Now the magisterial “Women of Algiers” could disappear back into a dark mansion den or, even worse, a climate-controlled, tax-exempt airport warehouse until it has appreciated sufficiently in value. 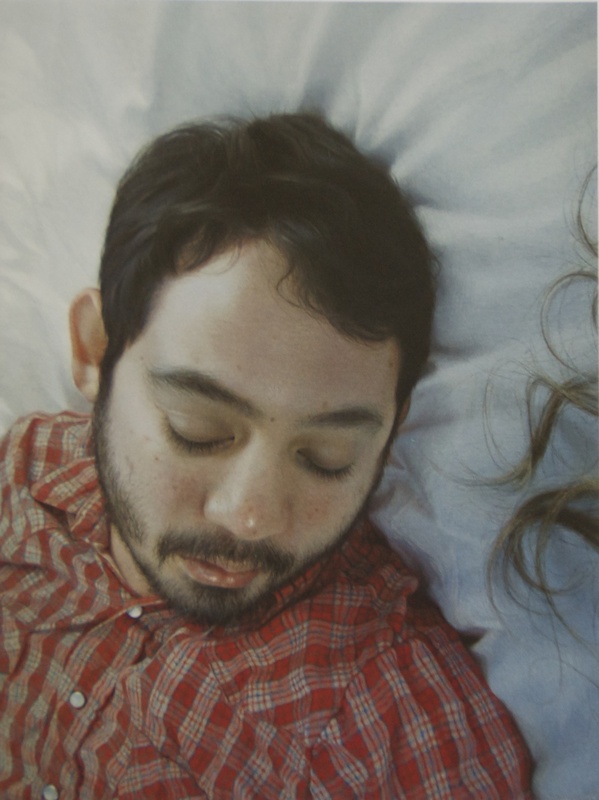 One of the first place winning paintings from Erin Wozniak, in the Manifest INPA4 competition/publication. The painting is astonishing enough, but even moreso when you see how small it is. 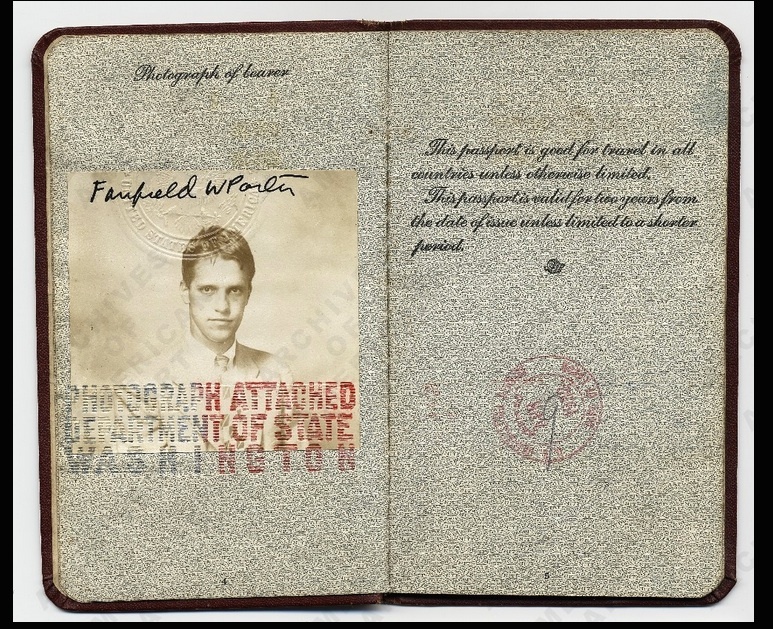 This guy was young and going places–to Russia at one point to meet with Trotsky, believe it or not, though he was disappointed by what he saw there. By the end of his life, in his Yale lecture, he sounds disenchanted with government as a whole. I’ve read several stories recently, in Forbes, the Guardian, and at other sites, that question whether or not art is a good investment right now. The implied question is: are we or are we not in a “bubble.” The discussions are built around the highly-publicized prices of the most expensive work sold at the art fairs and in auctions. From my remote perch here in Western New York, where I pay little attention to how creative work gets monetized—except when I try to figure modest prices for what I do—it’s an issue that seems to have little impact on me and most of the artists I consider friends. We all price our work in a range that’s reasonable enough to be safe for anyone who buys the work. It’s a safe expenditure for a couple reasons. First, there isn’t that much room for the price to drop if the market for art somehow were to collapse (as real estate did in 2008). When the bottom fell out of housing prices in 2008, homes in Rochester hardly dropped in value. They hadn’t skyrocketed up in price during the real estate bubble, therefore they were actually valued close to their worth to most families who actually wanted to live in them, not invest in real estate for a quick profit. Second, and more importantly, the people who buy my work, and the work of others I know personally, don’t buy it as an investment, but simply because they want to own it. They know how much labor and talent goes into the work and they see the price as an accurate reflection of both, not as a fleeting marker of an investment’s worth during a continuous boom in value across the art world. 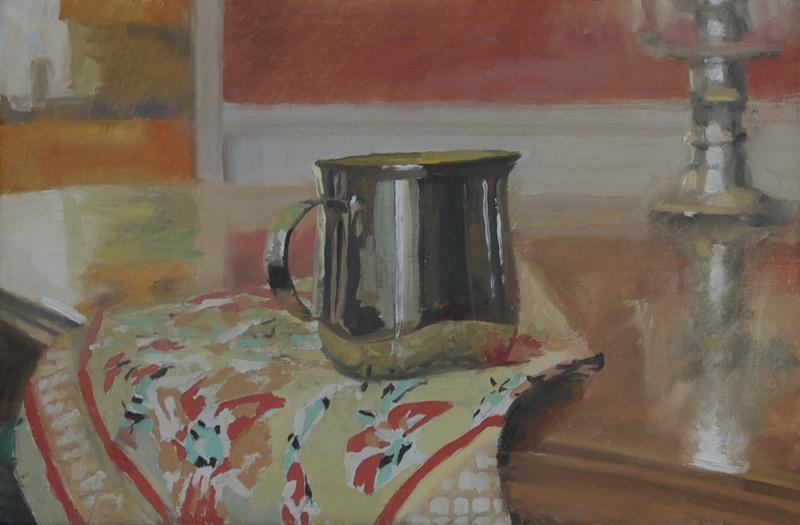 That second point was why I found it so encouraging to have sold seven paintings at my recent Oxford Gallery show. Some were very small, and some were among the largest in the exhibit, so prices had little to do with whether or not people bought the work. The collectors who bought the work—and one in particular who wanted to buy a painting but didn’t—based their purchases on the desire to look at the paintings. (The one who wanted to buy but refrained simply had no more wall space for new work and she had her eye on one of the larger paintings.) You would think these factors would invariably be the case in sales of art, but I suspect that much of the work that sells for millions of dollars now could just as easily go into a vault somewhere as onto someone’s wall. And that money could have been spent just as readily on shares of Apple. I’ve communicated with several of my collectors, and they have said repeatedly how much they love the work they now own, how much what they get from looking at it is worth what they spent on it. For these people, the vagaries of an inflated art market have no relevance at all. I’m sure they don’t want the value of the work to drop—who would? But it isn’t a concern, because they have no plan to ever sell it. What could be better—for me and for them? It’s how the making, selling and ownership of art ought to work, every time. As SoHo boomed, Mr. Bates became more alienated. His working-class roots were at odds with the culture enveloping the scene he once knew. “The glitz, glitter and boutiques. It became about fashion, money,” said his wife, a librarian who had lived with Mr. Bates in his Grand Street loft throughout the ’70s. “That wasn’t something that Leo…” her voice broke off. “He was a painter,” she said. And in practical terms, he could not afford to stay. When he lost the lease on the loft, Mr. Bates decided to withdraw. In November 1978, he sold a batch of paintings. Using the proceeds, he made a down payment on 367 Seventh Avenue in Park Slope, moved into the apartment above the storefront and all but vanished. “That’s the last time he sold anything,” Mrs. Bates said. In the following years, with the help of his wife’s family, he bought two more walk-ups on the same block in Park Slope, and he became, at least in the eyes of the world, a landlord. In 1982, Mr. Bates went to a closing party for a show of Mr. Rappaport’s work on Downing Street in the West Village. As Mr. Rappaport recalled, Mr. Bates was upset with him, because Mr. Rappaport had used a small gift from his father to take out an advertising spread in Artforum magazine to promote the show. “Fairly early in the evening, Leo got up after having a few drinks and he said: ‘Richard is a fool. He just demonstrated how closed the art world is and what a fool I am to even try,’ ” Mr. Rappaport remembered. “And he picked up a serving plate and hurled it at one of my paintings on the wall.” The two never spoke again. Mr. Bates had a few paintings in group shows in the early ’80s, but from the time he moved to Brooklyn, virtually all that people saw in his hand were the signs he hung outside his buildings: apartment available, inquire inside. “We didn’t talk to anyone about the art,” Mrs. Bates said. . . . . Looking at Mr. Bates’s work, it is clear that something happened when he left Manhattan and moved to Brooklyn. When he plunged into deep solitude, he found something new. There were the muted tones of the Bowery years, the simple triangles, and then suddenly, an explosion of color, mesmerizing patterns. After the initial burst, the paintings grew more austere. There was more negative space and the colors grew a bit fainter with the years, but the palette remained the same. As did his passion for geometry: Mr. Bates’s last paintings were huge X’s and chevrons that when examined closely revealed tiny grids of dabbed paint. Mrs. Bates said she did not believe that her husband regretted his decision to work in obscurity. His goal had been not to pander to passing tastes, or to scatter his work to the four winds. He had just painted. You are currently browsing the represent weblog archives for the month May, 2015.